I discovered Fusion Virtuoso quite by chance. As I made my way back along Wellington’s Manners Street to my hotel one Friday night a few weeks ago, this pavement blackboard stopped me in my tracks. Fusion Diversity? The art of thinking independently together? – Interesting! I followed the arrow. Fusion Virtuoso Bar Restaurant! 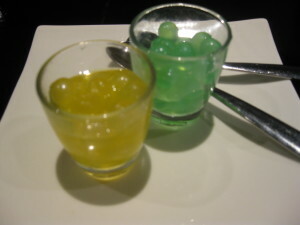 The name suggested exotic dishes, unexpected blends of flavours, imagination, creativity and flair. I glanced back at the blackboard. There were no menu specials, no prices, just that fragment of philosophy – very cool, very zen, very different. Fusion Virtuoso is very cool, very zen and very different. It is a calm and restful place with lots of space, lots of black, lots of white and very gentle light. Pots of plants provide splashes colour. At the front is a lounge area with comfortable chairs and low tables. 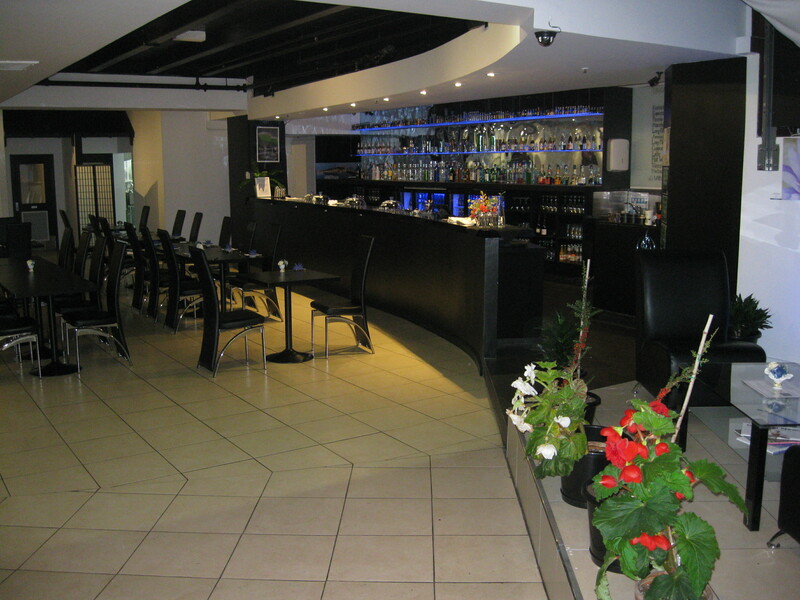 To the rear there is a bar, lit with blue neon strips (Fusion Virtuoso’s colour, as it happens) and a dining area, with simple black tables and chairs. Jordan was behind the bar when I arrived. His warm and friendly welcome made me feel instantly at home. He found me the perfect table, at the back, against the wall, with a great view through the restaurant, to the street. Then he withdrew, leaving me to the menu. The Fusion Vituoso menu is everything that the name suggests. With tastes from Europe, Asia, South America, the West Indies, the Pacific as well as Aotearoa New Zealand, it’s a mouth- watering read. There some fabulous combinations – imagine caramelised kimchi, French duck and kumara noodles! It took me quite some time to make my choices but Jordan did not hover or hurry me. I decided finally on the Lite Fish Salad entree. This subtle, melt-in-the-mouth tuna infused cottage cheese and tomato dish, on its bed of crisp lettuce, cucumber and soy beans, was the ideal starter. Not too little, not too much, with just enough flavour to sharpen the appetite. It was an extremely hard decision but after dithering for ages between the Kimchi Duck and the Sauteed Pork, I settled on the latter. 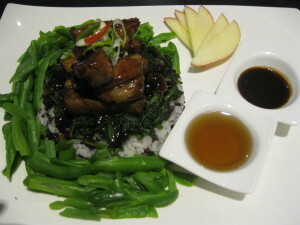 “Inspired by the bright lights of Tokyo”, this dish brings together an amazing palette of tastes and textures – salty, juicy, tender marinated pork strips, sharp, tangy spinach, beans with the perfect crunch factor, delicately flavoured rice (two types) and, best of all, sweet Turkish apple tea sauce. Everything had that fresh, just out of the pan, home-cooked (but in a good way!) flavour. Not only was this dish absolutely delicious, it looked like a work of art. I read the dessert menu avidly and was seriously tempted by the Hazlenut chocolate rolls. The crispy, sweet, spring rolls filled with hazelnut and chocolate, accompanied by ice-cream flavoured with Aotearoa’s own invention, pineapple lumps, sounded like a slice of heaven. Sadly, I could eat no more. But then, Fusion Virtuoso’s operations manager, Becky Chin, brought out two dishes filled with what looked like tiny, gleaming gold and jade jewels. They were in fact, little drops of frozen fruit juice. Although usually served as a palate cleanser, they are the perfect dessert solution for the person who is looking for a sweet, but also small, light and healthy finale. I rarely dine alone, so when I do I want to luxuriate in the experience. Everything matters – environment, service and of course cuisine. Fusion Virtuoso ticked the all top boxes on my solo dining list. The restaurant environment was relaxing and attractive. The service was exemplary; Jordan and Becky were friendly but not invasive, attentive but not overbearing, gracious, but not effusive and most of all, thoughtful and intuitive. The Fusion Virtuoso cuisine was a totally new, delightfully different taste experience and it was evident that thought, care and imagination had gone into sourcing, preparing and presenting it. My one regret that night was that I didn’t sample a Fusion Virtuoso cocktail, but I think a dedicated session might be required to fully appreciate these. 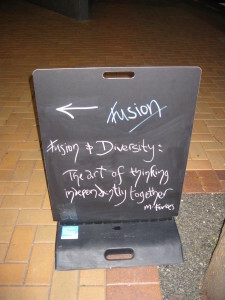 Check out www.fusionvirtuoso.co.nz and read all about the people, the philosophy and the commitments that underpin this very cool, very zen, very different Wellington restaurant.